An all-in-one printer that performs reliably and doesn’t cost much, the Epson Stylus SX100 printer offers all the basic functions in conjunction with a variety of components such as Epson Stylus SX100 ink cartridges. With 32.7 x 43.4 x 18.5 cm dimensions and 4.6 weight, it produces fine quality text and images with functions and features that include generic and sufficient control panel located at the left-hand side, a Contact Image Sensor (CIS) scanner to handle documents up to A4 and more. The printer can be connected to a home PC for printing and can also be used to carry out functions of a colour photocopier in standalone mode. Also, the Epson Stylus SX100 printer is a compact all-in-one printer that prints smoothly with numerous ink cartridges, notably with Epson Stylus SX100 ink cartridges at minimal cost. It also yields fine borderless photos from 10x15cm to A4 size and though the only connection option available for it is a USB 2.0 socket at the back and it doesn’t support connecting a PictBridge camera, your printing jobs will not be hampered once you are accustomed to printing in this mode. The printer has also secured a certification for its energy conservation feature. Besides, software installation that may be required at any point for the printer is also easy. Additional support for printing web pages and basic photo editing functions is also provided with purchase of this printer. Choosing Epson Stylus SX100 ink cartridges will be the right choice and decision that can be taken. 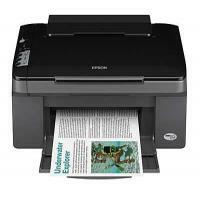 The Epson Stylus SX100 printer is a very economical and efficient performer that even prints images in colour. Though not high on very advanced features and functions, it carries out important, regular tasks efficiently and also saves energy. How to align the Epson Stylus SX100 Ink Cartridges for better print quality ? Step 1. Turn on the Epson Stylus SX100 printer and load the paper. Step 2. For Windows: Right-click the printer icon on your taskbar . Select Print Head Alignment. Macintosh OS X : Open the Applications folder and select EPSON Print Utility. Select your Epson Stylus CX in the printer list, click OK, and select Print Head Alignment. Step 4. If you can't find an aligned pattern, choose the one that's closest to being aligned. Click Realignment and then Print to print another alignment sheet and repeat this step. Step 5. Click Print to print a color horizontal alignment sheet, if there is no gap or line between the rectangles and enter its number in the box on the screen. Step 6. Click Finish to close the Print Head Alignment Utility. Even after aligning the printheads, the print quality does not improve, try replacing the cartridges with the new Epson Stylus SX100 Ink Cartridges that will probably help to resolve the issue with quality of the print. How to install the new Epson Stylus SX100 Ink Cartridges? Step 1. Power on the Epson Stylus SX100 and make sure that the document cover is closed, then open the scanner. Step 2. Press and release the ink button. Power On and ink lights flashes. Note: Do not hold down the ink button for more than 3 seconds or the printer will start to clean the print head. Step 3. Open the cartridge cover.Squeeze the tab at the back of the cartridge and lift it straight out. Dispose of it carefully. Step 4. Before you open the new Epson Stylus SX100 Ink Cartridges package, shake it four or five times. Then remove it from the package. Note: Do not touch the green chip on the front of the cartridge. This can damage the ink cartridge. Step 6. Close the ink cartridge cover and press it until it clicks into place and close the scanner. Replacing the old and dried ink cartridges with the new Epson Stylus SX100 Ink Cartridges will result in better print quality. Q. Are compatible Epson Stylus SX100 ink cartridges good at producing colour prints? A. Yes, you can choose these Epson Stylus cartridges for your printing tasks if high-quality colour printing is what you are looking for. In addition, these ink cartridges are also ideal for regular printing jobs. Q. Should I use a dry cloth or should it be damp to wipe chips on ink cartridges to remove dirt from their surface? Can I clean ink off surfaces with a cloth as well? A. Please use a soft cloth or a tissue which is slightly damp for wiping the chips of ink cartridges. You can clean ink with a damp cloth or tissue as well. Q. I have previously purchased different brand ink cartridges from you and would like to place an order for Epson Stylus SX100 ink cartridges for the first time. I want to know if 1-2 days delivery facility is available on these cartridges as well. A. Yes, you can avail of 1-3 days delivery services on the purchase of these Epson ink cartridges too; in fact, we offer such services on practically all our products. For that, all you have to do is place your order before 12.00 noon (Monday to Friday). Q. Will the warranty on my Epson Stylus SX100 printer become invalid if I install compatible Epson Stylus SX100 ink cartridges in it? A. No, your printer warranty will not become invalid if you use compatible ink cartridges. You just need to be vigilant and avoid clicking on firmware updates, as companies try to coax customers into accepting the updates, which blocks compatibility with non-genuine cartridges that would be beneficial for their sales. Q. Will I get money back guarantee if I purchase a four-pack set of Epson Stylus SX100 ink cartridges or is it only for bigger multipacks? A. The money-back guarantee is applicable on the four-cartridge set and on all single cartridges too. Q. What is the approximate amount of ink offered by Epson Stylus SX100 ink cartridges? A. The estimated volume of ink contained in the cartridges is 13 ml for each black, cyan, magenta and yellow coloured cartridges. Q. Can I expect to get borderless photos using this printer? A. Yes, the fine borderless printing from 10x15cm to the A4 size of photos is possible using this printer. Q. Can I switch between the original and compatible Epson Stylus SX100 ink cartridges? Will this affect my printer performance? A. Absolutely not, switching from original to compatible won’t affect your printer performance. All you need is to properly feed the cartridges and clean them on regular basis. Q. Will I get any discount on ordering Epson Stylus SX100 ink cartridges for the first time from this site? A. Yes, you will get the discount of 5% for your first purchase from this site. You can use the coupon code FIRSTORDER at the time of checkout to avail the offer. Also, If you are engaged in regular printing work can order for the multipack or buy them in bulk. This will reduce your expenses to minimal. Q. Do you offer a money back guarantee for the products purchased from this site? Q. What are the general specifications of the Epson Stylus SX100 printer? Dimension 434 x 327 x 185 mm, weighs 4.6 kg (excluding Epson Stylus SX100 ink cartridges and power cable). Comes with individual Epson Stylus SX100 ink cartridge options. A. At PrinterInkCartridges we are committed to selling the best quality cartridges with a 100% user satisfaction guarantee. Once you receive your order make sure that you check all the items carefully before using them. Please retain your invoice or delivery note as you may need it in the event you wish to return your product. If you have a problem with one of our products or wish to arrange a return please contact us by telephone on 048 30833221 or drop an email us on info@printerinkcartridges.ie. Q. What are the limitations of this printer? A. The Epson Stylus SX100 printer has limited features and comes with a moderate printing speed, not very quick compared to the other printers of the same range. Also, connecting to PictBridge camera is not supported in this printer. Q. What terms and conditions should be kept while purchasing Epson Stylus SX100 ink cartridges from this site? Q. What type of paper size does the Epson Stylus SX100 printer use? A. We always recommend using the good quality paper to serve your printing purposes. The printer takes A4 size as the standard paper size for printing any type of document.